You are currently browsing the category archive for the ‘Maroon’ category. Genesis 25:19, 21-27 “Now these are the records of the generations of Isaac, Abraham’s son…Isaac prayed to the on behalf of his wife, because she was barren; and the LORD answered him and Rebekah his wife conceived. But the children struggled together within her; and she said, “If it is so, why then am I this way?” So she went to inquire of the LORD. The LORD said to her, “Two nations are in your womb; And two peoples will be separated from your body; And one people shall be stronger than the other; And the older shall serve the younger.” When her days to be delivered were fulfilled, behold, there were twins in her womb. Now the first came forth red, all over like a hairy garment; and they named him Esau. Afterward his brother came forth with his hand holding on to Esau’s heel, so his name was called Jacob… When the boys grew up, Esau became a skillful hunter, a man of the field, but Jacob was a peaceful man, living in tents. Many people think of the crucifixion of Christ as what you see in old paintings and art. A man with a tiny trickle of blood coming from this hands, feet and head- hanging on a sanded and smooth cross. Yet, that is not an accurate picture of the death of Jesus. The most incredible description of the events of Christ’s humiliation and death that I’ve found are on this website. Be aware though: it’s highly graphic. For simplicity’s sake, I’ll cut and paste his beating and death. I found 2 good descriptions, and will take a little of each to help explain it. “While most are aware that Jesus was beaten and then crucified, few comprehend the horrific mutilation that occurred to His body both before and during His crucifixion. Jesus’ body was so beaten and battered that He was virtually unrecognizable to the people of His day. To help clear your mind of the typical picture of a barely-scarred Jesus hanging from a cross, a detailed examination of His execution must be described. While various forms of crucifixion were used, we will describe one possible method. Before being crucified, Jesus is forced to undergo a severe scourging. To begin the horrible ordeal, He is stripped of His clothing and His hands are bound to a post above His head. A Roman legionnaire steps forward with a flagellum—a short whip with jagged pieces of bone, glass and metal tied into nine strips of leather. This is commonly referred to as a cat-o’-nine-tails. The heavy whip is brought down without mercy, over and over again, across Jesus’ shoulders, back and legs. At first, the flagellum cuts through the skin only. But as the blows continue, they cut deeper into the flesh, causing blood to ooze from the capillaries and veins. Blood then begins to spurt from smaller arteries in the underlying muscles. The flagellum begins to produce large, deep bruises, which are then ripped open by succeeding blows. In time, the skin of Jesus’ back is hanging in long ribbons, like spaghetti. The entire area is an unrecognizable bloody mass of torn flesh. The severe beating is halted when the Roman centurion in charge has determined that Jesus is near death. Though the Jews had a law that prohibited more than 39 lashes, there is speculation that the Romans would not have made any attempt to obey the statute. At this point, Jesus is close to being in shock. One can only imagine the agonizing pain pulsing through His nerves. He is then untied from the post and allowed to fall to the ground—soaked in His own blood. The soldier performing the beating notices a great irony in a “simple, unsophisticated Jew” claiming to be a king. A robe is thrown across Jesus’ shoulders, and a stick is placed in His hand, like a scepter. To complete the mockery, flexible branches covered with long thorns are formed into a crown, which is pressed firmly into Jesus’ scalp. Since the scalp is one of the most vascular areas of the body, profuse bleeding begins almost immediately. The soldiers proceed to mock Jesus and strike Him across the face. They then take His “scepter” and strike Him on the head—the thorns are driven deeper. At last, the soldiers grow weary of their vicious attack and tear off Jesus’ robe. This causes agonizing pain, similar to carelessly removing a surgical bandage, due to His robe having bonded to the clots of blood and serum in His wounds. Significant bleeding takes place once again, as though He were being whipped with the flagellum. Ironically, in respect of Jewish custom, the Roman soldiers return Jesus’ garments, and then make Him carry a long wooden beam along His back. The condemned “criminal,” along with the Roman soldiers, begins His slow journey to the site of the crucifixion, Golgotha. Jesus struggles to walk erect, but considering the immense weight of the wooden beam and the state of near shock produced by incredible blood loss, He constantly falls. The weight is too much to bear. The beam gouges into the shredded skin and muscles of the shoulders. Jesus tries to rise, but the endurance of His muscles has been exceeded. Wanting to hasten the crucifixion, the centurion-in-charge selects an onlooker—Simon of Cyrene (Matt. 27:32)—to carry the beam. Jesus follows behind Simon, perhaps slightly relieved, but still bleeding and in near-shock. “Jesus’ Crucifixion: Jesus is again stripped of all clothing – not even a loin cloth (contrary to images depicted in artists’ paintings). Simon is ordered to place the cross on the ground and Jesus is quickly thrown backward with His torn shoulders against the wood. The legionnaire feels for the depression at the front of the wrist. He drives a heavy, square, wrought-iron nail through the wrist and deep into the wood. To comment on the shout Jesus must have released is too much to bare. Quickly, he moves to the other side and repeats the action being careful not to pull the arms too tightly, but to allow some movement. The cross portion is now hoisted to the upright pillar where it fits into a groove near the top. Jesus left foot is now pressed backward against the right foot, and with both feet extended, toes down, a nail is driven through the arch of each, leaving the knees moderately flexed. The Victim is now crucified. To make matters worse, the Victim is mocked by His executioners as well as some of the religious onlookers in the gathering throng. As He slowly sags down with more weight on the nails in His wrists, excruciating pain shoots along the fingers and up the arms to explode in the brain – the nails in the wrist are putting pressure on the median nerves. As He pushes Himself upward to avoid the stretching torment, He places His full weight on the nail through His feet. Again there is searing agony of the nail tearing through the nerves between the metatarsal bones of the feet. At this point, as the arms fatigue, great waves of cramps sweep over the muscles, knotting them in deep, relentless, throbbing pain. With these cramps comes the abiility to push Himself upward. Hanging by His arms, the pectoral muscles are paralyzed and the intercostals muscles are unable to act. Air can be drawn into the lungs, but cannot be exhaled. Jesus fights to raise Himself in order to get even one short breath. Finally carbon dioxide builds up in the lungs and in the blood stream and the cramps partially subside. Spasmodically, He is able to push Himself upward to exhale and bring in the life-giving oxygen. It was undoubtedly during these periods of fighting for air that Jesus uttered the seven short sentences which are recorded. The Death of Jesus: hours of this limitless pain, cycles of twisting, joint-rending cramps, intermittent partial asphyxiation, searing pain where tissue is torn from His lacerated back as He moves up and down against the rough timber in order to take a breath. Then another agony begins. A terrible crushing pain deep in the chest as the pericardium slowly fills with serum and begins to compress the heart. It is almost over. The loss of tissue fluids has reached a critical level; the compressed heart is struggling to pump heavy, thick, sluggish blood into the tissues; the tortured lungs are making frantic efforts to gasp in small gulps of air. The markedly dehydrated tissues send their flood of stimuli to the brain. We have had our glimpse at what Christ went through – a terrible sight, and more than enough to leave us depressed and despondent. Not only did Christ endure the cross for us, but he knew that it was coming. He knew the scriptures and was familiar with all the text. These verses in Isaiah were written 700 years before Christ’s birth. Yet, Isiah 53 so accurately describes exactly the life and death of Jesus, it’s almost as if it was written after the fact. Yet He willing endured it all for you and I.
Isiah 53 -“Who has believed our message? To whom will the LORD reveal his saving power? 2My servant grew up in the LORD‘s presence like a tender green shoot, sprouting from a root in dry and sterile ground. There was nothing beautiful or majestic about his appearance, nothing to attract us to him. 3He was despised and rejected—a man of sorrows, acquainted with bitterest grief. We turned our backs on him and looked the other way when he went by. He was despised, and we did not care. 4Yet it was our weaknesses he carried; it was our sorrows that weighed him down. And we thought his troubles were a punishment from God for his own sins! 5But he was wounded and crushed for our sins. He was beaten that we might have peace. He was whipped, and we were healed! 6All of us have strayed away like sheep. We have left God’s paths to follow our own. Yet the LORD laid on him the guilt and sins of us all. 7He was oppressed and treated harshly, yet he never said a word. He was led as a lamb to the slaughter. And as a sheep is silent before the shearers, he did not open his mouth. 8From prison and trial they led him away to his death. But who among the people realized that he was dying for their sins—that he was suffering their punishment? 9He had done no wrong, and he never deceived anyone. But he was buried like a criminal; he was put in a rich man’s grave. He was “crushed” so that we might live!!! I am just in such a great place. God has really blessed me. This Thanksgiving, I had a chance to reflect on all the blessings I have in life. First, I have a WONDERFUL God who has given me so much. Like I have said in previous entries, I know that every gift is from God. He has given me life. He gave me His Son and now I have eternal life through Christ. That alone is so much to be thankful for. He has given me an absolutely incredible husband. We are so perfect together. We complement each other so well. My husband is thoughtful, sweet, funny, good-looking, compassionate, passionate, caring, sensitive, strong, and just all around- the man of my dreams. He has supported me in everything I do and has been an amazing daddy!! He has given me wonderful children. Every day, I wake up with overflowing love for my two precious daughters. My 3 1/2 year old is so sweet and smart. She’s got so much energy and always loves to run and laugh. Yet, in the same moment will just come over and give me a kiss because she loves me. My 19 mo. daughter is so expressive. She is so smart. She loves to be wherever her sister is. She loves to be outside and play. She makes the cutest faces and has the most amazing expressions. She cracks everyone up. She is sweet and lovable. He has given me a wonderful family. My parents have been so great. They loved me and raised me to love the Lord. They support me in everything I do and are there for me. My sister and brother-in-laws are great. I love my mother and father in laws and we get along great. I have the best job in the world! 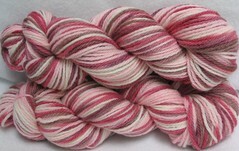 I am at home with my girls all day, and I dye yarn on the side. I love the influence I get to have on my children. And yet, I have a creative outlet. I have been blessed with amazing customers, who have been so sweet to me. 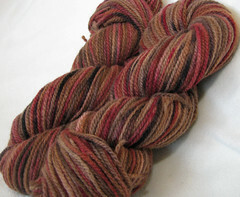 In fact, this colorway was inspired by a customer who wanted a custom done for her brother for Christmas. I have wonderful partners and am so thankful that this has been working out so well. I am thankful for my health, my house, my husband’s income and his job that he loves, for my car that runs, for the food on our table, for my education and for so much more. You see, “my cup truly overflows”. God has given me so much, and I am so thankful!! I was out on a date with my husband, when this verse came on the radio. I instantly knew what colors I’d see it to be. Green, like dark emeralds. Maroon, like deep rubies. Navy, like dark sapphires. And white- like diamonds. Precious jewels. Valuable to most. Yet, this scripture tells us that Wisdom is more valuable and nothing can compare with it. I think it’s ironic that this set of verses starts off with admonition for taking the Lord’s correction seriously. And then it talks about wisdom. I think that the Lord is often trying to teach us and correct us lovingly, the way most parents do their own children. Yet, I think, as stubborn adults, we often turn away from His correction. Part of wisdom is knowing when to take correction. This verse also says that Wisdom leads to happiness and long and pleasant life. This philosophy is so different than what many people think of today. They think fame, wealth, beauty will make them happy. Yet look at Hollywood. Those people are famous. Yet they can’t even go to the bathroom without cameras following them. They long to raise their families in peace, but are subjected by constant paparazzi. They marry the ideal man/woman. Yet, look at the divorce rate. Look at how long the marriages last. They have wealth, yet look at how many end up in alcohol/drug rehabs. Do they seem really happy? Truly peaceful on the inside? True peace and contentment can only come from God. He offers us things not of the world. Wisdom is one of the gifts he offers us. And I think that one who is wise will understand that the pleasures of the world are temporary and fleeting, and therefore would rather go after eternal things. A wise friend in college said that she just committed to praying for wisdom. And the Lord answered her, for she was wise beyond her years. And she blessed my life in the process. I think I need to start daily praying for wisdom, for I long to have the life God promises us we’ll have with it. Jacob begins his long journey, both physically and spiritually, from his home and family. Shortly after he leaves home, God appears to Jacob in a dream, presenting the image of the ladder from heaven to earth. God speaks to Jacob and promises him protection, offspring, and the land on which he lay. Jacob then travels on to Haran, where he meets and falls in love with his cousin Rachel, the daughter of his mother’s brother Laban. Jacob arranges with Laban to work seven years to marry Rachel. However Laban, who has something of a shady reputation, substitutes his older daughter Leah for Rachel on her wedding night. Jacob confronts Laban, but is told, ironically, that the older has precedent over the younger. Jacob agrees to work seven more years for Rachel as well. Years pass and the sisters, as well as their servants who are given to Jacob as concubines, bear Jacob twelve sons and a daughter. These sons will become the ancestors of the 12 tribes of Israel. At the end of the portion, Jacob and his family depart from Haran and from Laban, and begin their journey back to Canaan. I chose the colors of pink because she was Leah’s sister, and she bore Jacob 2 sons: Joseph and Benjamin. The brown is for the years Jacob worked for her, 14 in all. The brick red and maroon are the heartache over her not getting her husband for 14 years and being barren for many years thereafter.